Comfortable barn conversion in peaceful countryside setting. 1 bedroom single story barn conversion in a very quiet rural location. Ellie and Richard welcome you to the Hairy Pigs' Rural Retreat. The barn, tucked away behind the owners' home, was converted in 2009. Initially run by Ellie as an award winning bed and breakfast, but laterly converted to letting accommodation providing very peaceful and comfortable accommodation for two. Wake to bird song each morning. There are no noisy roads nearby, just peace, quiet and tranquillity. Perfect for those who enjoy walking, cycling, bird and wildlife watching or simply relaxing. Situated in the Yare Valley, the southern side of the Norfolk Broads, close to the picturesque village of Loddon, you can spend your time here either exploring Norfolk and North Suffolk or staying local, enjoying walks on along the Wherryman's Way, Hardley Flood, Rockland and Surlingham Broads, the Ted Ellis nature reserve and local RSPB reserves. Despite the quiet location we are very close to Norwich (15 - 20 min drive to the city centre). The Norfolk and Suffolk coasts are within easy reach and the delightful Waveney valley towns of Beccles and Bungay are less than 15 mins drive. Ellie ran a very successful B&B but has now converted the accommodation for holiday letting. We moved from Norwich because we wanted to live in the countryside. We love the area because it is rural but not far from civilisation! The river Yare is about a mile from our door and we have lovely views of the grazing marshes from our home. Otters, marsh harriers, waterfowl, chinese water deer, barn owls can all be seen on the nearby rivers, fields and marshes. We are ideally situated for walking along the Wherryman's Way footpath. Hardley Windmill is situated along the path and is open to the public during the summer. RSPB nature reserves are a short driving distance away. Located in South Norfolk we are close to the county of Suffolk not far from the lovely market towns of Beccles and Bungay. Norwich is a easy 20 minute drive. Southwold is only 40 minutes away. One ensuite to bedroom with shower. Towels and tea towels and bed linen provided. Bath sheet, hand and face towels including flannels. Comfortable sofa, Dining table with two chairs. Free Wifi is available. Round pedestal table for two. Small private garden area contains a bistro set for two. You can watch the sun set from here. Storage available for two bicycles. Please note that the nearest pub is 2 miles away in Loddon and Chedgrave. This was our third visit to Hairy Pig's but the first during wintertime. As always it was very comfortable and the central heating made it really cosy. Even in December there was plenty to do locally - lots of birdwatching, carols in the local pub and festive shopping in Norwich to name a few. Elena as always was very welcoming and helpful. The barn was tastfully decorated. The sleeping arrangements are either a double bed or two large singles, so sleeps two people and is very very comfortable. Has a lounge with a two/ three seater settee and large TV, underneath which is a CDplayer / recorder.. Kitchen is well equiped for two and the heating is available if required. The location is good if you are a sesoned walker. If not, car has to be used for every trip out. We really enjoyed our stay and found nothing to grumble about. 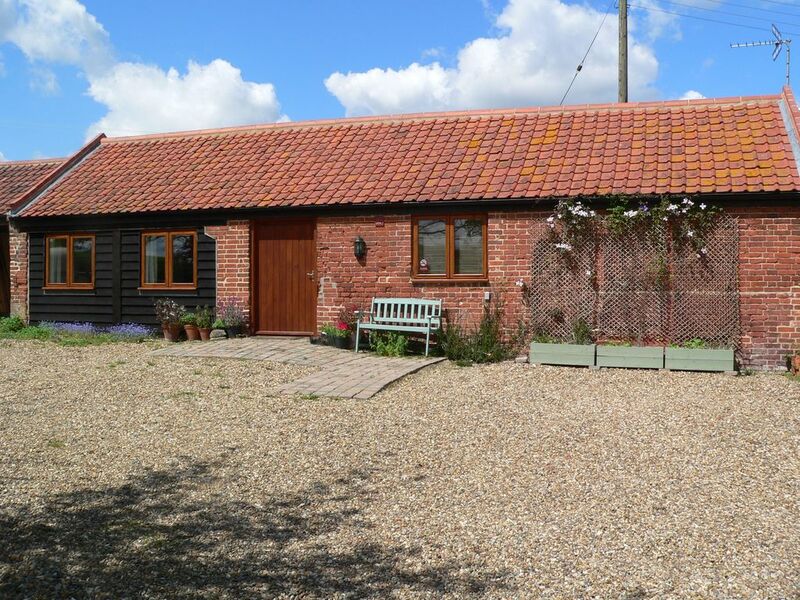 We had a comfortable few nights in this spacious, well equipped barn conversion. We appreciated the fan provided as the weather was very hot. There was also a small shady area to sit outside. I enjoyed the gluten free cake thoughtfully provided by the owner after I had mentioned my dietary requirements. Perhaps the only thing we should have brought was some shower gel. There were a large number of leaflets with local information and a folder of places to eat locally. Some of the local roads are quite narrow but once on the main road it's quite quick to get into Norwich. The property was lovely and clean, the owners are there if you need them. peaceful location, will stay here again. Very roomy and comfortable. Internet is OK but not fast and mobile phone signal poor in general in this part of the world. Plenty of walks in the area. The local pubs do food but can be pricey so we went into Norwich to a Brewers Fayre and also had a meal at The Rushcutters along the road which was very nice and next to the river. A visit to the Highway Garden Centre is a must as it is a good place to get a meal too. Great Yarmouth and Lowestoft 30 minute drive away. Southwold 45 mins. Loddon and Chedgrave are 2 miles away. Norwich is 10 miles. Beccles is 8 miles. Shops, pubs, restaurants, cafe, bank, convenience stores located at Loddon and Chedgrave. Booking Notes: Arrival time from 4 pm. Departure time 10 am.